Nothing can compare to the feeling of being a mom or a dad. The sheer joy of helping to guide a little person’s journey into becoming a well rounded successful adult. You want to be there for every part of it, not wanting to miss a single step, or sadness or celebration. Unfortunately we live in a world where many parents are separated from their children more then they would like to be. This is due to work, being overseas to protect our country and even divorce. For four years my husband and I raised our two children together even though he was working in another city and state Monday through Friday. To this day I still remember the joy that would fill our children when he would come home Friday night and the tears that would start Sunday morning and last until they fell asleep Sunday night because their dad had to leave in the afternoon. The upward rise of emotions as the week would progress because they knew he would be home after dinner on Friday. While for us that ordeal stopped almost three years ago, what we did for our children is still evident today. Call it long distance parenting, or virtual parenting… I call it parenting. Just because one parent is away doesn’t mean that rearing and raising your children becomes the responsibility of the parent that is there every day. Parents have to work together to make sure that each of them is as involved as possible in raising the children. It isn’t as difficult as it seems, it just takes a commitment from each parent to one another and the children that they are still a family and mom and dad are a team and they are taking care of them equally. First, never disagree over parenting decisions that one parent makes in front of the children. Support one another, this presents a unified front to the children. They have to know that calling mom or dad isn’t going to change the decision that was made at home. What my husband and I used to do it call each other earlier in the day, usually while the kids were doing homework or out playing and we would talk about what went on that day, if there was an issue that needed to be addressed we would discuss it, I would had out the “punishment” and when he would call them after dinner, he supported the decision and reiterated to them why that decision was made. We always supported one another on what each of us said to the kids. If we disagreed, that was a conversation that we would have at a later time, when the kids weren’t listening. We never argued, just talked. Two phone calls everyday guaranteed, one where we would talk about decisions and updates on the kids and one where he would get to talk with the kids, each and every night. He never missed one. Don’t threaten the children with “You wait until mom/dad get home.” Being apart from one of the parents is difficult enough. The last thing you want to do is make homecoming a sad and terrible time. Deal with issues as they arise and make sure both you and your spouse are on the same page when talking with the kids. This way once mom or dad come home the time is spent bonding with one another, focus on spending quality time with the kids during the day and quality time together once they go to bed. 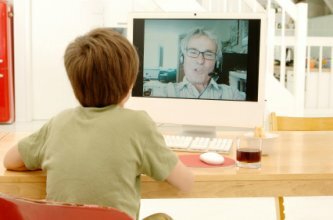 Thanks to technology it is also possible for the parent that is away to send email messages, instant message and even do a video conference online. If you have internet service at home there are many free programs that you can use for each of those items. A simple webcam that can be bought for about $10 at your local superstore and a Skype account can make it possible for everyone to see each other. This is important because you don’t want to just be a voice over the phone. If the children can see you everyday it makes the distance seem not as bad. Depending on the age of your children you might also want to consider a family blog. Services like WordPress and Blogger offer password secured blogs. This makes it possible for the kids to write to mom or dad on their own time, with some privacy. Sometimes it is just hard to get out what you want to say over the phone… in front of other family members. Being able to type it and have mom or dad read it and respond can be beneficial. Nothing will ever replace a parent being able to hug or touch his or her child. Being away from your children is difficult, whether it is for days or months. That is why it is important to make sure that you and your spouse stay in touch daily and make sure that you keep in touch with your children each and every day.